Hundreds of workers across England and Wales have walked out in support of nearly 650 construction contractors sacked from the Lindsey Oil Refinery. It came after about 1,200 workers staged unofficial walkouts at the North Lincolnshire plant, in a jobs dispute. Workers in Teesside, South Wales, Cheshire and Yorkshire are among those to have come out in support. Expected talks aimed at resolving the dispute at Lindsey - owned by Total - have failed to go ahead, Acas has said. The sacked Lindsey workers have been told they have until 1700 BST on Monday to reapply for their jobs. They had been building an additional plant next to the existing site in Killingholme, but withdrew their labour last week in protest at a sub-contractor axing 51 jobs while another employer on the site was hiring people. The workers argued this broke an agreement not to cut jobs while there were vacancies elsewhere on the site. Total insists no such agreement was in place. 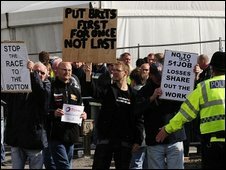 Workers insist the assurances were given in February following a bitter dispute in which they said foreign labour was being used to exclude British contractors and to undermine hard-won conditions. The foreign workers row led to to a wave of unofficial strikes and protests at refineries and power stations across the UK. Workers are now claiming management at the Lindsey refinery are using the redundancy process to victimise activists involved in the previous wildcat strikes. The number of workers sacked by contract firms at the Lindsey refinery was reported late on Thursday to be nearly 900, but was revised by Total to 647 at midday on Friday. Total said the refinery was continuing to operate as normal. Union leaders said they and officials from conciliation service Acas had waited for talks for four hours on Friday before being told Total "no longer felt the need" to meet. Acas said: "After discussions between Total management and their contractors, they decided not to go ahead with the talks. We remain in touch with the parties." The union Unite's Assistant General Secretary Les Bayliss said they had been ready to discuss a resolution, but were told the employers would not talk until after Monday. "This is yet another subversive manoeuvre, displaying a complete lack of diplomacy. Unite remains ready and willing to assist in finding a way through the problems arising from the unofficial dispute. We are urging Total to do the same," he said. In North Yorkshire, contract workers took support action at Drax and Eggborough power stations, near Selby. The GMB union says the total number taking part at Drax, Eggborough and Ferrybridge is about 600 workers. Workers at Fiddler's Ferry power station in Cheshire, owned by Scottish and Southern Energy, also showed their support by walking out. Text messages were reportedly being sent to fellow workers around the UK to encourage them to take action. Total managers at Lindsey had asked the striking contract workers to return to work, but late on Thursday confirmed "with regret" hundreds had been sacked. It said any contract staff who wanted to return could reapply for positions until Monday. A group gathered outside the main gates of the Lindsey refinery on Friday, waving placards accusing bosses of greed and urging them to "share out the work". 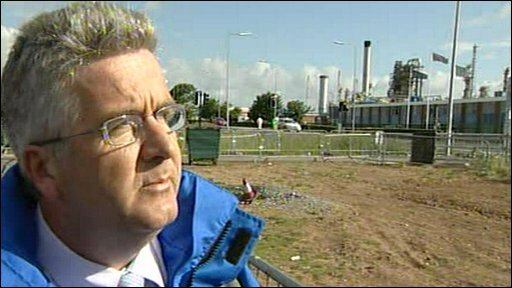 Earlier on Friday Bernard McAulay, national officer of the Unite union, had arrived at the Lindsey refinery for the expected negotiations. He said he was "always hopeful" but criticised the way the dispute had been handled, describing the employers' actions as "despicable". GMB union general secretary Paul Kenny said: "Total have not tried to resolve this dispute, they sought to escalate it and they have sought to victimise people." A growing number of sacked refinery workers are picketing one of the entrances to the giant refinery. They cheer as they are beeped by passing cars and lorries. The placards held aloft read "Put British Workers First". And that's the essence of this bitter dispute. They claim Total had offered an assurance that no jobs would be lost here while foreign workers were employed on site. A claim the company denies. The pickets have all been here before, spending days on end in January protesting at the employment of Italian contractors over their UK counterparts. But this protest has been different - unsupported by their unions and unofficial. That's why they've been sacked, but there's an olive branch - if they apply for their old jobs by Monday then they have the chance to work here again. On the picket line though they're in defiant mood - describing Total's actions as brinkmanship, vowing to stay out in protest until agreements about foreign workers and redundancies are more clearly defined. But the human resources manager at the refinery, Bob Emmerson, has defended the company's approach. "We would welcome talks, but for those talks to take place, we have to have the people back in work," he said. "There is a due process to go through that is agreed with the unions, that is agreed with workers in the construction industry, we have lines of communication that are open, we have elected union representatives." One of the sacked Lindsey workers told the Press Association: "We are asking for support from workers across the country which I am sure will be given. Total will soon realise they have unleashed a monster. "It is disgraceful that this has happened without any consultation." Another sacked contract worker, John McEwan, said: "We were left no option. If we have to defend the rights of our men on these sites and our pay and conditions then we have to do that." 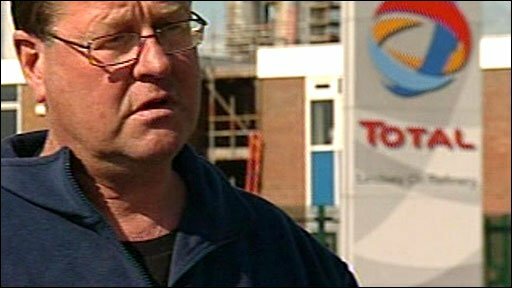 In a statement, Total said the sacked workers had been involved in "an unofficial, illegal walk out" that was "repudiated" by both Unite and the GMB. "Total can confirm, with regret, that our contractors have now started the process of ending the current employment contracts for their workforce on the HDS-3 construction project," the company said. Total said it had "repeatedly sought to encourage the workforce to return to work so that proper negotiations can take place". The construction project will remain closed in the meantime. The site is the third largest refinery in the UK, processing 10 million tonnes of crude oil per year. Total added that the 51 disputed redundancies were necessary because the relevant part of the project had been completed. Downing Street has criticised the strike action. A spokesman said: "Unofficial strike action is never the right response to industrial relations problems." Are you an employee or contractor at Lindsey Oil Refinery? Have you gone on strike in support of the sacked Lindsey workers? Send us your comments using the form below.